Following some of the notoriously dishonest and instructively self-projecting accusations that his rhetoric is spiked with ("Muehlenkamp, with his usual dishonesty,[…]", "Muehlenkamp misrepresents or hides my arguments and avoids providing the answers he owes,[…]") Mattogno (pp. 1270f.) 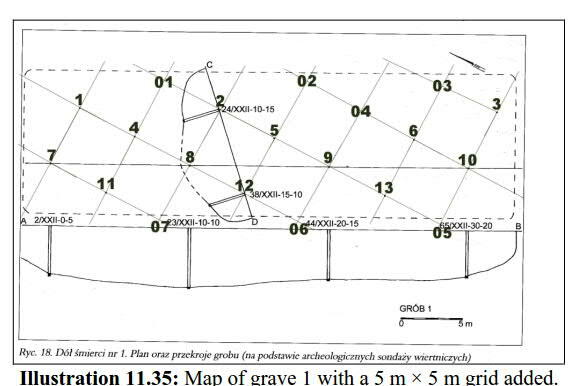 quotes the arguments presented in his Bełżec book in support of his claim that "the layout" Prof. Kola gives for the graves "is completely random, as is their surface area, their volume, and even their number". [a] Contrary to Mattogno’s accusations, Kola’s team was well aware of the difficulties created by postwar robbery digs in identifying the mass graves at Bełżec, and can thus be assumed to have duly considered the possibility of a modification of the original shape and/or size of the graves due to robbery digs. Thus the observed damages to the original grave structure in the area between graves 12, 13, 14 and 24 are expressly mentioned in the description of grave # 13. [b] Moreover 26 out of the 33 graves identified by Kola have a regular geometrical shape, which can hardly have been the work of robbery diggers, and in six irregularly shaped graves the original regular shape that was later modified can be made out. [c] As to the bottoms of the graves, the only ones in which the author could make out ‘bumps and holes’ are graves nos. 8, 14 and 20, which are expressly mentioned by Kola as having resulted from a connection between previously neighboring graves. [d] The bottoms of all other graves, as the author sees them, are shaped either like a tub with a fairly regular bottom or like a swimming pool progressively deepening towards a certain spot. These shapes may be related to the composition of the soil at Bełżec, which was made of sand or sandy loam and would thus make steep rectangular walls unadvisable as these would more easily cave in. Regarding counterargument [a], Mattogno quotes Kola’s statement that in the zone between the graves No. 12, 13, 14, 24, "in surface layers the drills showed numerous damages of grave structures, probably caused by levelling works or robbery digs. ", and accuses me of omitting the mention of levelling works "in order to pretend that Kola was referring exclusively to "robbery digs."". Mattogno doesn’t reveal what benefit for my argument I’m supposed to have derived from this omission, which was obviously related to Mattogno’s argument having been all about the presumed impact of postwar digging in the area (also by criminal investigators, but mainly by robbery diggers) on the accuracy of Prof. Kola’s finds. and asks what "idiot" would have dug mass graves like these. Mattogno doesn’t tell what’s supposed to be so "idiotic", obviously hoping for readers who will take their guru’s word at face value instead of thinking. 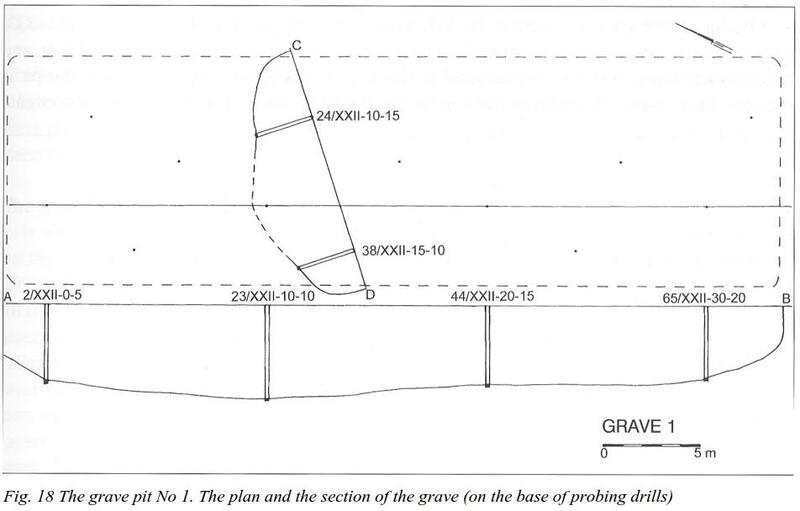 For the only thing "wrong" about the grave drawn in the lower section is that it is somewhat deeper at drill 563/XV-0-35 than at drill 577/XV-5-35, as it was not dug evenly to the bottom. This suggests the work of people without much experience in grave digging, which is what SS personnel of Aktion Reinhard(t) certainly were at least at the beginning of their "work" - not military trained specialists in grave digging, but predominantly non-military supervisors who had previously worked in the Aktion T4 murder program, as I had pointed out on p. 433 of the critique. It is also possible, of course, that this grave was originally two graves of different depths, the separating walls of which were destroyed by postwar robbery digging. 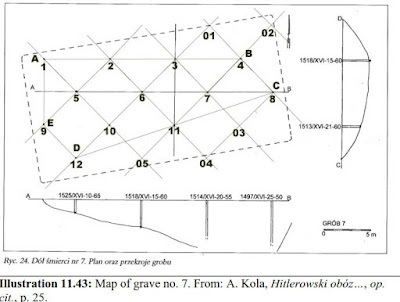 The latter possibility would affect Kola’s conclusion about the area of this specific grave, but the combined areas of all graves identified by Kola would remain unchanged. The upper section, on the other hand, shows a grave dug in a fairly even manner on both sides, with sloped walls such as would be recommendable in sandy soil to prevent them from caving in. Quite professionally done rather than "idiotic", this grave suggests that the Bełżec staff learned to make more proper graves as they went along, or then obtained assistance from people who knew how to dig graves. As concerns counterargument [d], Mattogno accuses me of making "mere conjectures", before producing his own conjecture about the contour of the graves’ bottoms having resulted from factors "such as wild diggings by Polish villagers and blending of distinct smaller pits of different depths" (the latter, as mentioned before, wouldn’t help Mattogno’s argument as concerns the combined area of the graves identified by Prof. Kola, but merely affect the archaeologist’s conclusions as concerns the area of a specific grave). Mattogno doesn’t explain why my conjectures (of which he left out the part regarding the initial inexperience of the AR camps’ staff in digging graves) should be less valid than his. Regarding counterargument [b], Mattogno repeats the dot-connecting exercise shown below, whereby he created 21 areas "quite unrelated to Kola’s numbers and shapes, as is apparent from a comparison with O’Neil’s map of the graves (see Illustration 11.33 a & b)". This forced Mattogno to do some further gymnastics in order to uphold his claim that Prof. Kola's estimating the shapes and sizes of the mass graves on the basis of his core drilling finds was "arbitrary". In Illustration 11.35 I present my elaboration of the drawing into which I inserted the 5 m × 5 m grid used by Kola, the positions of the positive drillings (1-13) and those of negative drillings (01-07). From this drawing it results that Kola’s delimitation of the grave would have required drillings 01, 02, 03, 05, 06 and 07 to be positive, and for this very reason Kola’s conjecture is arbitrary and inadmissible. This renders moot Mattogno’s further considerations regarding mass grave no. 1, namely the conjecture that it was actually three smaller graves placed next to each other. The pit was registered at the borderline of ha XV and XVI in their southern part. It was estimated on the base of 4 deep drills (No 293, 294, 406, 407). A small amount of crematory remains scattered around reported. The grave was in a shape of a rectangle with the size of about 16.00 x 6.00 m.
doesn’t look like its area is only 30 m², for its long sides are at least 10 meters and its short sides at least 5 meters long. 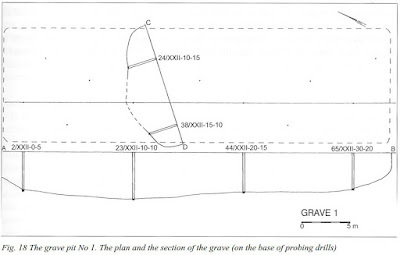 Kola may have assumed that the grave extended beyond the "positive" drill points, which is not unreasonable considering the relatively long distance (5 meters) between drills, especially where an adjacent drill is marked blue for "soil disruptions – unidentified camp objects or disruptions next to graves". Mattogno may yell that such probability considerations are "arbitrary", but unless he can demonstrate that the exact limit of a grave was a "positive" drill point and there were not and could not have been any human remains beyond that drill point (which is a rather improbable proposition), his yelling is moot. The grave of a relatively small volume located in the north-eastern corner of ha XV estimated on the base of only 1 deep drill (No 529) and two neighbouring ones, shallow (No 510, 528). The size is 9,00 x 5,00 m with the depth up to 1,90 m.
How could Kola identify a grave of 9 m × 5 m based on two drillings made 5 m apart? The drilling map confirms this arbitrary act (Illustrations 11.41). 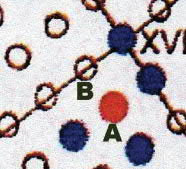 Here only one drilling appears (the second is the one I have indicated with the letter "B"). The blue circles around it designate "Soil disruptions – Unidentified camp objects or disruptions next to the graves." Kola has therefore prolonged in an arbitrary way by 2 m the limits of the grave on both sides (2 + 5 + 2 = 9 m) while fixing its width in the same arbitrary way to 5 m.
Contrary to what Mattogno claims, the grave was identified on the basis of not two but three drills ("1 deep drill (No 529) and two neighbouring ones"), so there are three instead of two dots that should be red, and considering that these were "neighbouring" drills, the missing ones are in all probability the drill marked with the letter "B" by Mattogno and the drill above that one. The farthest distance between drill points would thus be 10 meters, whereas Kola’s estimate of the grave’s length is 9 meters. As to the width, Kola apparently assumed that the grave extended 2.5 meters beyond the drill points on each direction, an assumption certainly more reasonable than assuming that the grave was a 9 meter strip no wider than the drill points. Mattogno lists further graves whose dimensions, as he claims, are "arbitrary and much bigger than one can deduce from the drillings". He doesn’t provide particulars about why he considers these graves to have been estimated too big, so his claims cannot be checked. Probably what Mattogno decries as "arbitrary", like in the case of grave no. 11 (and also grave no. 4, see above) amounts to no more than reasonable assumptions about how far a grave extended on either side (or on either of two sides) of a drill point. With drill points are far as 5 meters apart, Kola had to make such assumptions, and as it was his task to identify burial areas so that they wouldn’t be disturbed by construction work on the site, it is not unlikely that Kola preferred to err on the side of caution. This, of course, wouldn’t necessarily mean that his estimates are wrong and the graves he identified were much smaller in area than he estimated them to be. The above rationale applies to grave no. 21, which Mattogno gleefully decries as Kola’s "biggest abuse" because "based on a single drilling Kola manages to "ascertain" that around the drilling point there was a grave of 5 m × 5 m!". We see that Kola didn’t claim to have "ascertained" the size of this grave, but merely to have estimated it. We further see that Kola made no secret of his methodology, which consisted in assuming that the grave extended 2.5 meters (half the distance to the next drilling point) in every direction. This frankness makes Mattogno’s accusations of deceptiveness on Kola’s part come across as rather idiotic. To be sure, Kola didn’t make sure that there were human remains 2.5 meters in every direction from the drilling point. What he did, considering the contents he drilled into, was to take the midpoint between assuming that the grave extended up to the next drilling point in all directions (which would have been exaggerated as the surrounding drilling points included "natural strata") and unreasonably assuming that there were cremation remains at the drilling point only and nowhere around it. Indications like crematory remains above ground (mentioned in connection with grave no. 4) may have supported Kola’s midpoint assumption. 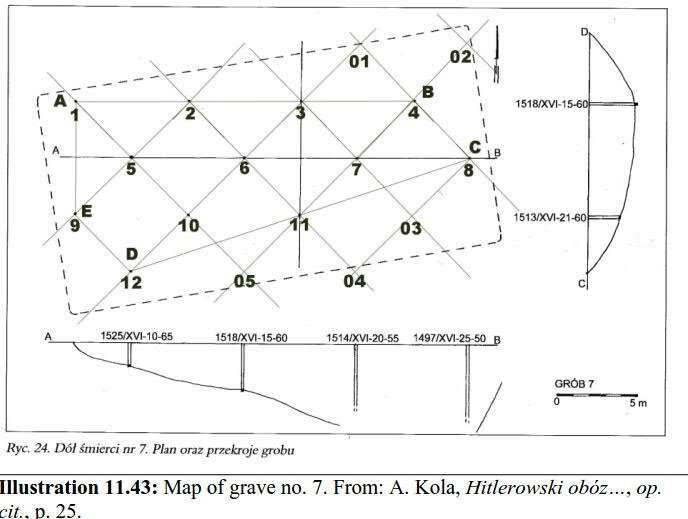 Mattogno may thus argue that Kola didn’t prove the area of this grave beyond doubt, but he cannot argue that Kola’s estimate is unreasonable and the presence of a grave 5 m by 5 m grave in this section of the camp can be ruled out. And his accusation of deceptiveness (or, as he puts it here, "abuse") is just plain silly. The area of the inner rectangle, judging by the distance (5 meters) between drill points, is 10 x 15 = 150 m². Additionally there are the two semi-hexagons on either side of the rectangle, so the grave’s area is well above 150 m², though as visible in the above image it’s not 24 x 18 meters. The length of the grave along its longer axis is 20 meters at the longest part according to the distance between drill points, so in order to reach an estimated 24 meters Kola must have assumed that the grave extended 2 centimeters beyond the last drill point in each direction. Along its shorter axis the grave is 15 meters long at the longest part as the distance between drill points goes, so in order to reach an estimated 18 meters Kola must have assumed that the grave extended 1.5 centimeters beyond the last drill point in each direction. Either estimate is not unreasonable and supported by the additional "much more shallow drills (with the ground bottom of about 1,50 m)" in the neighborhood that Kola mentioned, in which "crematory remains were reported". However, the drills map doesn’t bear out the grave’s rectangular shape claimed by Kola, as the edges of the rectangle are missing. Mattogno concludes that in graves nos. 1, 4, 7 and 10 alone, Kola "abusively increased their surface by approx. 680 m²". As we have seen, Kola indeed projected the lengths and/or widths of these graves beyond their farthest drill points (and accordingly increased their areas beyond those that result from connecting the drill points in the map on page 70 of his book), but this would only be "abusive" if it were unreasonable, and one can hardly speak of unreasonableness where Kola assumed, for instance, that a grave extended 1.5 or 2.5 meters beyond a drill point, especially where such assumption is – as in the case of grave no. 10 – supported by additional drills in which crematory remains were reported. As Kola made no secret of his methodology – measurements were given as estimates, not as certain values, and the plans and sections of each grave as well as the map of drills are made available were available for checking the reasonability of estimates made – Mattogno’s accusation that Kola’s procedure is "arbitrary and deceptive as to the number, shape and dimensions of the mass graves" is misplaced at least as concerns the "deceptive". 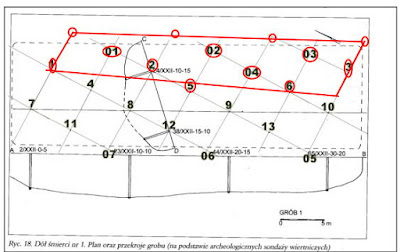 As to the further accusation that "Kola did not explain which of the actual pits – those really resulting from the drillings – were dug by the inspecting judge of Zamość (9 graves) and which and how many resulted from the wild diggings carried out for two decades by the [l]ocal population", it is questionable not only whether and how Kola could have established this information, but also what its relevance would be. 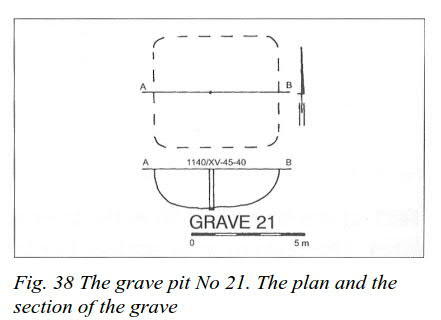 For insofar as the pits dug by criminal investigators or robbery diggers turned up human remains, any changes they may have made to the original grave structure would only impact the pinpointing of individual graves, but not the finds as concerns the combined area of all graves identified by Prof. Kola. The major shortcoming of Prof. Kola’s work, however, is none of those decried by Mattogno, but one that Mattogno preferred to keep silent about: Prof. Kola in all probability failed to identify all mass graves in the area of Bełżec extermination camp. Mattogno tried in vain to discredit Alex Bay’s air photo analysis pointing to additional apparent grave structures not detected by Kola, in an article that was refuted in an earlier blog. Mattogno doesn’t seem to have found any additional arguments against Bay’s analysis, judging by his having kept silent about this issue in MGK’s magnum opus. Mattogno prefers to follow up his attack on Kola’s plans and section with some rambling about my "silly argument" which refuted Mattogno’s earlier dot-connecting exercise by demonstrating that, by taking into account Kola’s information about the number of drills that were used to estimate the shape and size of a mass grave in each case, it was possible to group the dots in the map of drills on p. 70 of Kola’s book into units that a) bear some resemblance to the mass grave shapes shown on page 19 of the same book and b) match the number (33) of these shapes. In an obvious attempt to reverse the chronology of argumentation, Mattogno falsely claims that he had "in fact" taken into account Kola’s information about the number of drills that were used to estimate the shape and size of a mass grave in each case – something he only did in the magnum opus, after his earlier dot-connecting exercise had been refuted. In what is either a display of serious difficulties in reading comprehension or a most primitive lie, he then incredibly claims that it is clear that I "did not even understand that the drillings indicated by red circles in Kola’s map correspond to those effectively performed and registered in each grave’s drawing". Utterances of such fathomless stupidity only cause a yawn of utter boredom. Following this release of steam, Mattogno again displays his somewhat-less-than-honest (and somewhat-less-than-logical) approach to eyewitness testimonies, which he tries to use to his advantage where they fit his argument though he dismisses them as wholly unreliable where they are not. He presents the testimonies and drawings of two former members of the Bełżec SS-staff, Robert Jührs and Heinrich Gley, whose rough sketches and depositions suggest that there was a single field of graves (Gräberfeld) in the northwestern area of the camp. From these testimonies and drawings Mattogno boldly concludes that those of the graves identified by Kola that are not in the area corresponding to the field of graves (Gräberfeld) described by the mentioned witnesses – nos. 1, 2, 3, 4, 5, 15, 18, 19 and half of grave no. 14, with a total volume of 7,775 cubic meters, according to Mattogno – were not graves made to bury corpses during camp times but holes that subsequently came into being and into which cremation remains somehow made their way from the original graves. The first problem with Mattogno’s reasoning is that it is non sequitur, insofar as the existence of a Gräberfeld in a certain part of the camp’s area does not exclude the possibility of further graves having been dug outside that Gräberfeld as more grave space became necessary (or of those graves having been dug in an initial phase of the camp’s operation, before the Gräberfeld mentioned by Jührs and Gley was created). The second problem is that there would have been no reason for dumping cremation remains in pits other than those that had contained the corpses prior to cremation – not to mention whole corpses, for in the graves numbered 1, 3 and 4 the core drilling performed by Prof. Kola’s team also discovered whole corpses in wax-fat transformation. So while Mattogno congratulates himself by boasting that "Muehlenkamp’s "critique" has thus only served to strengthen my argument on this issue", the fact is that his argument doesn’t hold any more water with a i>Gräberfeld mentioned/drawn by Jührs and Gley than it does with a i>Gräberfeld mentioned/drawn by Jührs alone. Mattogno’s invoking Gley’s testimony in his favor is quite amusing if one considers that Gley also provided a most vivid description of the exhumation and burning of the corpses from the mass graves. One wonders how Mattogno might justify his cherry-picking of convenient snippets from testimonies he otherwise dismisses as wholly unreliable. Regarding Sobibór, I objected to MGK’s attempt to blame the size of the graves identified by Prof. Kola in 2001 by pointing out that the size of these graves is in line with what becomes apparent from eyewitness testimonies, such as led the Hagen District Court to conclude that in the camp’s first extermination phase the corpses were buried in large pits, each of them with a length of about 50-60 meters, 10-15 meters wide and about 5-7 meters deep. Mattogno quotes the pertinent parts of the judgment LG Hagen vom 20.12.1966, 11 Ks 1/64, then claims that the court’s findings of fact as concerns the graves are wholly based on testimonies provided by defendant Kurt Bolender prior to the main proceedings, which is unlikely as there is no indication to this effect in the judgment, and the measurements of the graves given in the judgment’s findings of fact are also not the same (according to Bolender, "A mass grave may have been approx. 60 m long, 20 m wide and 6-7 m deep"). Mattogno refers to Bolender in order to play his old trick, which is to cherry-pick snippets from a testimony he otherwise dismisses as unreliable in order to support one of his arguments. Bolender mentioned a second pit into which corpses were placed even before it had been completely finished, as the first pit was completely full. Mattogno sharply reasons that if "the other two graves" each had the dimensions 60 m × 20 m × 6-7 m, then there were would have been three mass graves with a total volume of 23,400 m³ before the exhumation and cremation of the corpses started, and if "the above-mentioned 80,000 corpses" were buried in 23,400 m³, this would mean a density of "3.4 corpses per cubic meter, even though they are said to have been buried in layers with the utmost care to maximize their packing density". This, so Mattogno cheers, "inflicts yet another decisive blow" to my "fantasies about the 19.51 corpses per cubic meter of Bełżec". In thus harking back to a previously discussed issue, Mattogno reveals (besides his dishonest cherry-picking trickery) his eagerness to jump to convenient conclusions not borne out by his cherry-picked snippets. For Bolender said nothing about a third grave, nor did he say anything about the extent to which the second grave was eventually filled. As previously pointed out, it is entirely possible that the overwhelming majority of the corpses buried at Sobibór before the camp’s body disposal method was changed to cremation (between 80,000 and 100,000) ended up in the first mass grave mentioned by Bolender. With no argument against the coinciding sizes of mass graves as described by who handled them and as established by archaeologists, Mattogno is reduced to insinuating that Prof. Kola "may have forced his conclusions", and to casting doubts on his finds based not on the actual drillings that led to identifying the graves (unlike his book about Bełżec, Kola’s report about his 2001 investigations at Sobibór contains no map of drillings), but on preliminary drillings that show "negative" results in the area later identified as pertaining to graves numbers 3 and 4, and "positive" drills arranged in a manner incompatible with the shape of the graves as identified by the final drillings. All fairly interesting, but preliminary drillings are one thing and final drillings are the ones that count, and the shapes of graves nos. 3 and 4 as outlined by Prof. Kola are corroborated by the coincidence of these shapes with greener areas clearly visible on a satellite photograph of the Sobibor memorial area, and with air photos published by archaeologists Isaac Gilead, Yoram Haimi and Wojciech Mazurek. Mattogno’s other argument against the accuracy of Prof. Kola’s finds is that they may have been influenced by the removal of trees from the area of the memorial in the 1960s, due to which Kola’s subsequent survey "must have encountered right from the start countless craters from the eradication of the trees". Maybe so, but how is this supposed to affect the accuracy of mapping mass graves based on core drills that encountered human remains in the subsoil, moreover where such mapping is, as mentioned above, corroborated by air and satellite photography? In the critique I had dismissed Mattogno’s far-fetched suggestion that postwar excavation had expanded a 300 m² lime pit (conveniently misplaced by MGK for the purpose of their argument) into a grave with a surface area of 1,575 m² and an estimated volume of 6,819.80 m³. Mattogno admits that the argument is wrong, though not for the "stupid" reason adduced by me (an enlargement of the mentioned lime pit to more than five times its original area apparently is within the realm of possibilities for Mattogno) but because the lime pit is located "along the eastern border of the camp, near the train station of Sobibór, which is far away from the mass graves area" - as I had also mentioned when pointing out that MGK had swiftly converted what the 1947 Central Commission Report described as a pit filled with chloride of lime "close to the eastern limit of the camp" into a lime pit close to the eastern limit of the camp’s burial area. Mattogno’s owning up to his and/or his co-authors’ misplacement of said lime pit is duly noted. As concerns Chełmno, Mattogno’s argumentation is equally amusing. 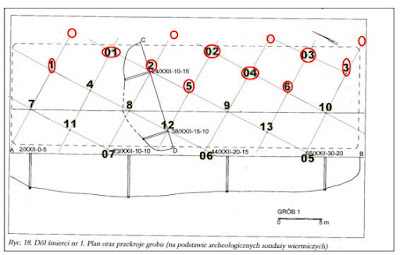 I had taken issue with his claim that archaeological investigations carried out by the Koniń District Museum in 2003/2004 to establish the location and size of the camp’s mass graves had "confirmed the three earlier arbitrarily-defined pits, and it could not be otherwise". By this statement Mattogno had bluntly accused the Koniń District Museum’s archaeologists of having manipulated their findings to vindicate a predetermined result, moreover one that been defined "arbitrarily" and not based on archaeological investigation. 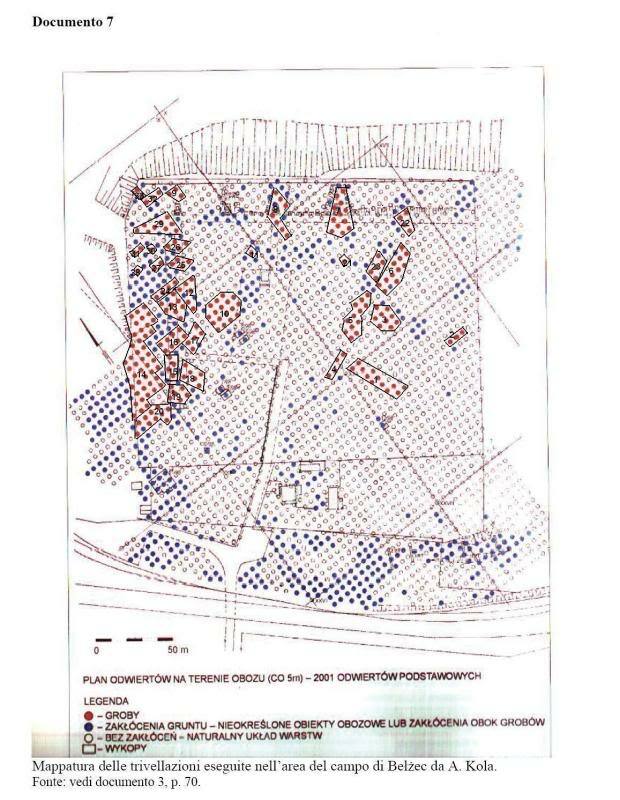 Actually, as I had shown in detail in an earlier blog, the 2003/04 survey had led to major corrections in regard to the previously assumed boundaries of two graves, furthermore established that one previously assumed grave area contained no grave, and discovered 11 ash disposal pits that had not been previously marked. To speak of an expectable ("it could not be otherwise") confirmation of "earlier arbitrarily defined pits"" in the face of these survey finds is the height of chutzpah, and Mattogno would have done himself a favor if he had at least kept silent about yet another occasion on which he had been caught with his hand in the cookie jar, proclaiming a blatant falsehood. Yet what he does on pp. 1290-91 of the magnum opus is to call my observations "completely silly" (now, that’s an argument!) and to quote at length the passages from his book that culminate in his embarrassing false accusation against the Koniń District Museum. Perhaps Mattogno hopes that an uncritical reader – which the "Revisionist" community is full of – will mistake for an argument what amounts to a spiteful brat’s yelling like, "yes I stole the cookies, and so what?". 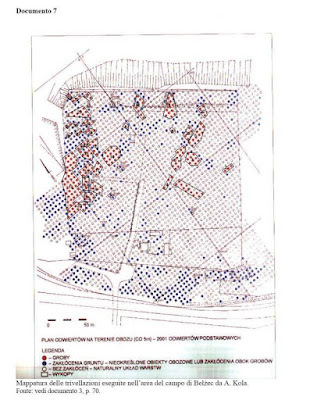 For further amusement he adds, as "Illustration 11.51" on p. 1294, the very same map I had used to expose his false accusation, albeit without the colored marks identifying the differences between the 2003/2004 survey results (red lines) and earlier assumptions regarding the number and size of graves in the camp’s Plot IV (green lines), which can be seen below. When the pits into which the ashes and crushed bones had been dumped were reopened in the course of the investigation, ashes, hair, traces of chlorine – apparently thrown in for the purpose of disinfection – bones and bone fragments as well as small objects were found, such as combs, buttons, purses, etc. (document of the protocol of investigations, card 530). It should also be noted that, because of soil fertilization with human ashes, the vegetation in this area is much more lush and green in color. Another of Mattogno’s falsehoods has thus been exposed, moreover on hand of an earlier quote produced by the accuser himself. It results that the 92,500 corpses alleged buried there would have had an average density of (92,500 ÷ 23,481 =) 3.9 corpses per cubic meter! Here as well, the alleged mass graves of Chełmno contradict Muehlenkamp’s fantasies about the claimed mass graves of Bełżec. Unfortunately for Mattogno – who apparently didn’t notice that his argument implies acknowledging that 92,500 corpses were not "alleged" but actually buried at Chełmno, and whose earlier arguments regarding burial density at Chełmno have already been addressed – his own quote of Bednarz’s finds shows that the judge didn’t consider these 11 pits as graves that had contained whole corpses at any time, but as "pits into which the ashes and crushed bones had been dumped", i.e. as mere disposal pits for cremation remains. 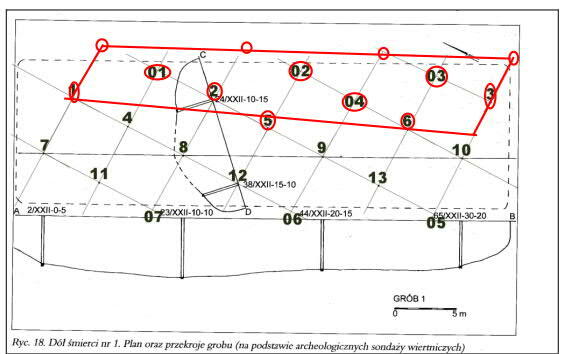 There is also no indication in the Koniń District Museum’s report about the 2003/2004 survey, authored by archaeologist Łucja Pawlicka-Nowak, that the archaeologist disagreed with judge Bednarz’s assessment as to the nature of these 11 pits – on the contrary. After this series of embarrassing blunders, Mattogno moves on to discuss the last section of the critique’s chapter 7. In the last section of the critique’s Chapter 7, I argued that the enormous size of the mass graves at the AR camps as described by eyewitnesses and/or identified by archaeologists, especially their depth, and the effort put into digging such huge mass graves, is in itself evidence that these mass graves were required to bury an enormous number of mass murder victims. Mattogno reacts to this argument with rather incoherent objections, quoting but failing to answer the question why a grave as big as Sobibór grave n.º 4 (for which I had calculated a volume of 6,819.80 m³) was needed when a few much smaller and more shallow graves would have been sufficient to dispose of the camp’s mortality. He ignores the footnote to this question, in which I point out that MGK’s estimate of 10,000 dead at Sobibór over a period of 16 months, assuming the minimum density of 3 corpses per cubic meter estimated by medical expert Mieczysław Piotrowski in an investigation of the Treblinka I labor camp’s mass graves in August 1946, would have required a mere 200 m³ per month, while grave n.º 4 alone (which according to SS witness Bolender was full after the first months of the camp’s operation) was 36 times larger. To bury 10,000 corpses at this low density a mere 3,333 m³ of burial space would have been required, which is less than half the burial space of grave nr. 4 alone and little more than one-third of the volume available for burial (9,525 m³) that I had calculated for mass graves nos. 3, 4, 5 and 6, i.e. the graves that Prof. Kola considered to have been burial graves that had contained (and still did contain) some whole corpses, as opposed to graves no. 1 and 2 where the archaeologist had found only cremation remains. People may make relatively small graves in order to toss a relatively small number of bodies inside, but who would expend the time, effort and resources required to dig five meters below ground and make a grave with a volume of 6,819.80 m³, only to then squander the grave space so laboriously created by burying corpses at a density of no more than 1-2 corpses per cubic meter? According to Alex Bay, a pit 50 by 25 meters with a volume of 8,500 cubic meters would "require weeks or months to dig by manual methods using picks, shovels, and wheelbarrows, depending on the number of laborers available"; even with mechanical excavators "the time needed to complete these large pits would have been on the order of a two or three weeks." The time required for the 6,819.80 m³ of Sobibor grave # 4 would be a little but not much less. One might think that Mattogno, Graf & Kues would like their readers to believe that the SS made graves big enough for a house to comfortably fit in because they liked to keep their Jewish labor force digging all the time, or because they enjoyed the healthy exercise themselves or were so fond of handling excavators that they made enormous graves just for the fun of it. The point stands. Mattogno did nothing to refute it. Worse than that, he did not even address it. Thus we come to the end of Mattogno’s response to Chapter 7 of the critique. The remaining paragraphs are mere rhetorical pep-talk saturated with invective ("Muehlenkamp’s arguments are absurd, incoherent, stupid, hypocritical and deceptive, and by posing them he has showed all the desperation of a person trying to defend the indefensible. "), which is without interest except for what it reveals about the contents of Mattogno’s mind. That is, undisturbed soil. There are also drill points in blue signaling "soil disruptions – unidentified camp objects or disruptions next to graves". Disruptions "next to graves" are distinct from "graves" in that no human remains (cremation remains or larger remains) were found in the drills. Nevertheless, they may be parts of graves consisting of soil layered over cremation remains, the latter not having been touched by the drill due to its shallowness or to the uneven nature of a former grave’s backfilling. On pp. 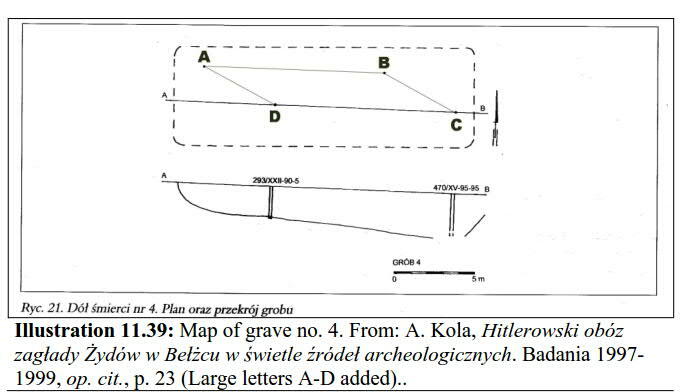 13-14 of his book, Kola wrote the following: "Because of the vast area of former camp in Bełżec, which required examining, the basic drills were located only in the knots of 5 m net, realising relatively little accuracy in defining the borderline shapes of the located objects (mass graves and non-grave objects." 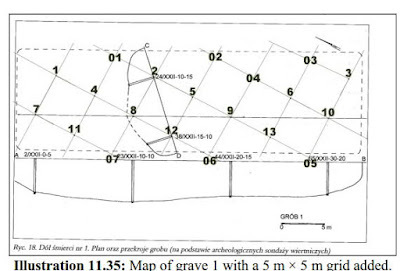 "Belzec Mass Graves and Archaeology - Continuation (2)" ([link]). Always the delicate flower, Mattogno attacks this writer in the strongest terms for having dared to challenge his conclusion, furiously accusing me of "stupidity and hypocrisy" in response to my having called his reasoning "somewhat less than logical". Gley’s account is quoted on p. 441 of the critique. Regarding Mattogno’s other "decisive blows" (and this writer’s counterblows) see Part 4 (Section 2) of this series. See critique, p. 392-93, and the "Sobibór" section of the blog "Mass Graves at Nazi Extermination Camps" ([link]). Carlo Mattogno, Chełmno. A German Camp in History and Propaganda, The Barnes Review November 2011. See also the blog "Mattogno on Chełmno Mass Graves" ([link]), where I translated the same passage from the Italian edition of Mattogno’s Chełmno book. See Part 4 (Section 2) of this series. See the blog "Mattogno on Chełmno Mass Graves" ([link]), where I show that Pawlicka-Nowak considers these pits to have been used only for burying human ashes and crushed human bones but not as mass graves for the burial of whole human bodies. Will the book be updates with this chapters? Glad to hear you are working on an updated book. kick these lying imbeciles heads off.